Instead of continuing to build up their network of flight routes, the airlines concerned have been operating more flights on fewer routes. Differing airline strategies are shaking up the range of offers in the low cost flight sector. Instead of continuing to build up their network of flight routes, the airlines concerned have been operating more flights on fewer routes. While Ryanair is ramping up its range of routes in the German marketplace, Germanwings/Eurowings is now starting to offer the first long-haul low cost flights to destinations such as America and Asia. This and much more has come from analyses carried out by scientists at the German Aerospace Center (Deutsches Zentrum für Luft- und Raumfahrt; DLR), which appear in the 2016 issue of Low Cost Monitor. 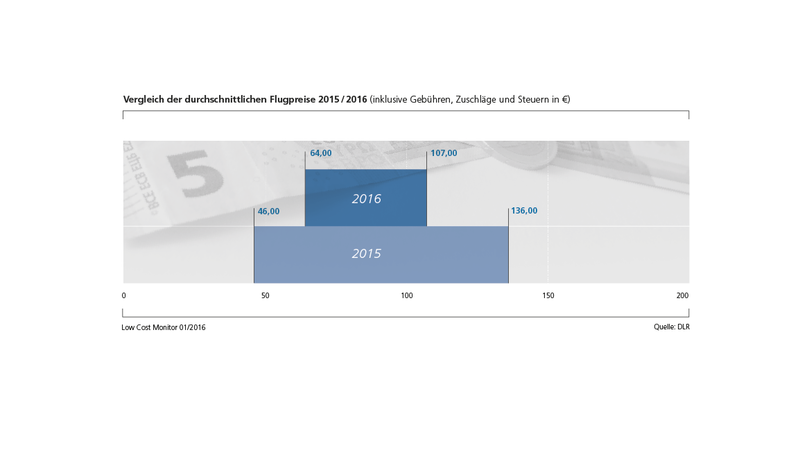 Passengers paid an average of between 64 and 107 euros for a flight ticket in spring 2016 – depending on the advance-booking period (one day, one week, one month, three months). Just last year, the price range between the most expensive and inexpensive flight price was even greater (46 and 136 euros). "Some airlines have reduced their ticket prices and others have increased them. Overall, this has led to an equalisation in the price range of flights," explains Peter Berster from the DLR Institute of Air Transport and Airport Research. But the trend may look different on individual routes: "On up-and-coming routes, low cost airlines are competing more and more with one another," says Berster. On popular routes such as Cologne/Bonn – Berlin, prices have dropped significantly. Low cost airlines are offering around four percent more flights and almost five percent fewer routes within and outside Germany. One reason for this is that Ryanair is making a big push into the German market, offering 60 percent more flights compared to last year. 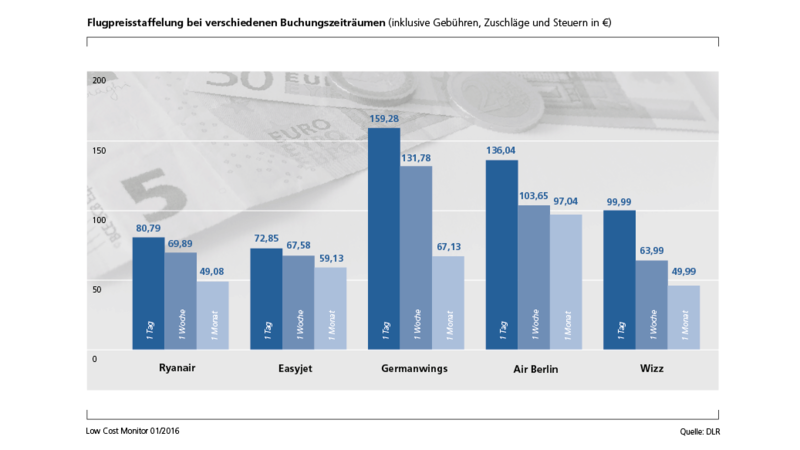 Germanwings/Eurowings, Air Berlin, and Ryanair are the three airlines with the most low cost flight offers in the German market. Germanwings/Eurowings has reinforced its leading position in the low cost market in Germany, offering over 200 destinations. 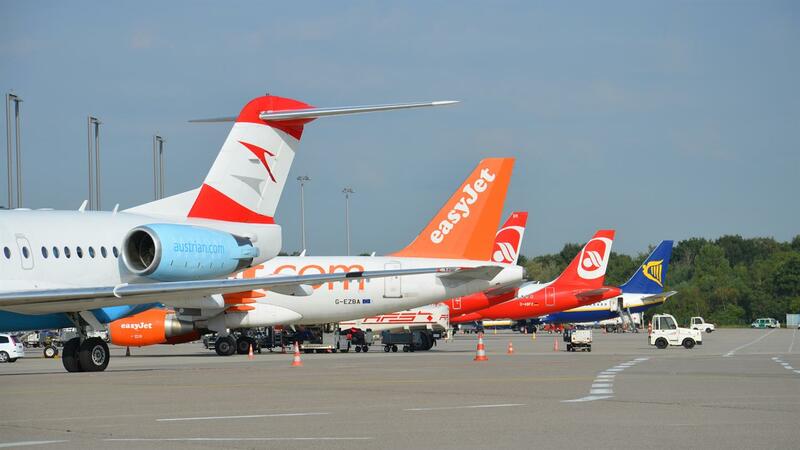 Across Europe, Ryanair and Easyjet lead the pack as the largest airlines in the low cost sector. Together, they have a share of almost 45 percent of the European low cost market. In the process, Ryanair has increased its flight offers by over 17 percent compared to last year. Easyjet has grown significantly too, with over seven percent more flights. This means that the home bases for these two airlines – Dublin and London Luton airports – are once again the top two airports in Europe handling the most low cost flights. They are followed by Barcelona in third place. 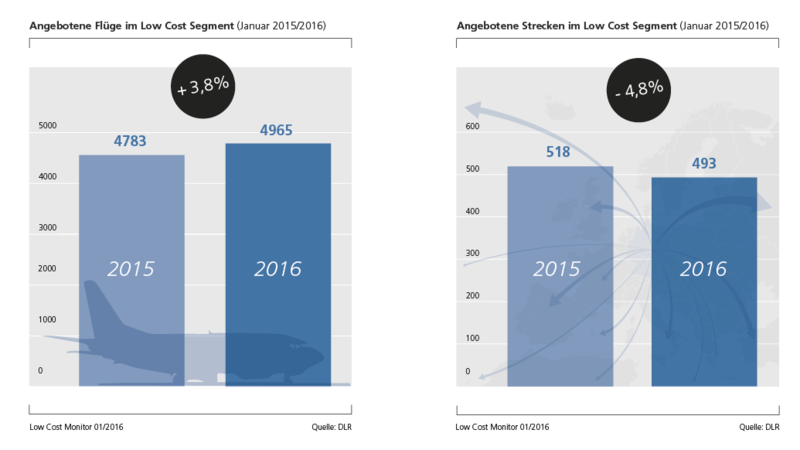 Overall, the market share in low cost traffic in Europe is around 28 percent. Ryanair's expansion has also led to greater airport capacity. Berlin-Schönefeld and Cologne/Bonn are prime examples. 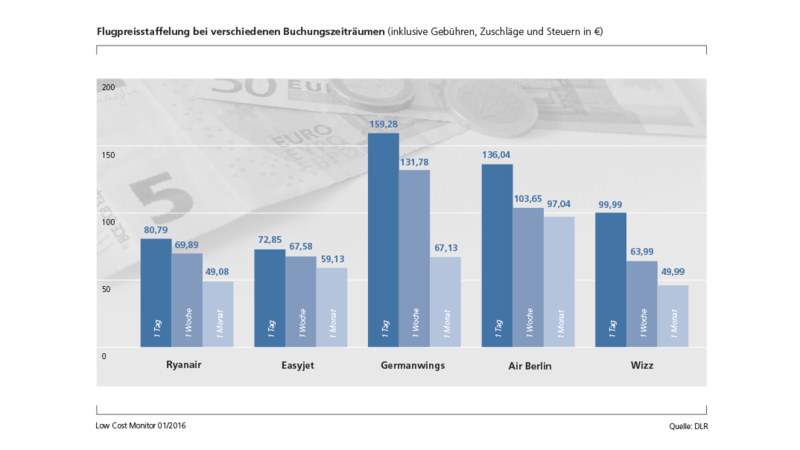 Cologne/Bonn airport is handling 572 low cost flights per week – almost a quarter more in this sector than in 2015. This means that low cost flights are accounting for 80 percent of total flights. 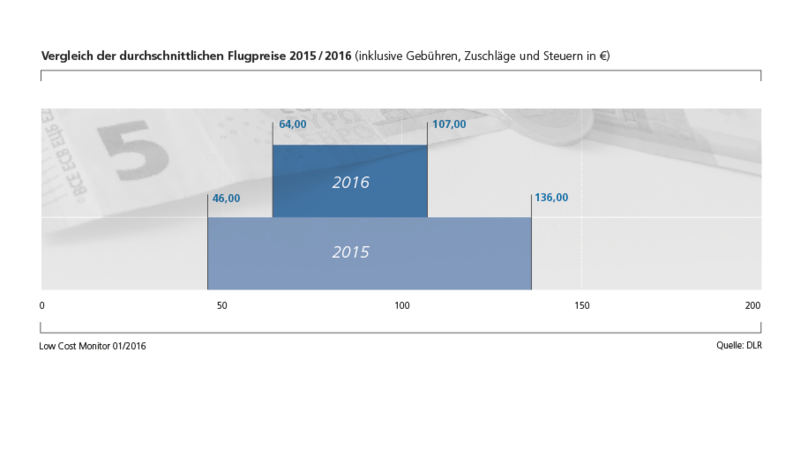 Schönefeld has also reached a low cost share of almost 80 percent as a result of the increase in Ryanair offers. The Irish low cost airline increased its flight offers from/to Schönefeld from around 40 flights a week to over 200. One in five low cost flights goes to the United Kingdom. This puts it back at the top of foreign destinations in spring 2016. Spain and Italy follow in second and third place. 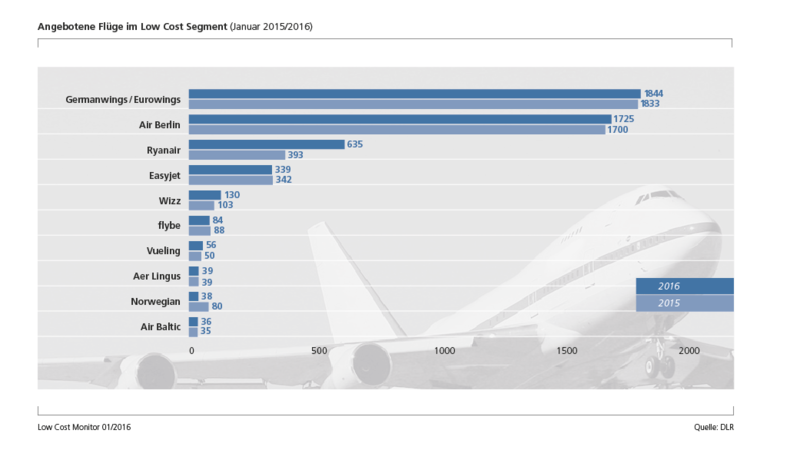 Although hardly any changes in the flights offered are seen here, scientists did record a growth in low cost flight offers to eastern Europe. "Hungarian low cost operator Wizz Air is continuing to build up its range of flights from Germany. However, Ryanair is also trying to increase its flight offers in this market," says Berster. Airlines often use a distinct format for their low cost offers. This means that it is difficult to define clear differentiation criteria for this sector, such as a lower price, general availability, or direct sales via the internet. The business models of some low cost operators also blend in with those of traditional airlines, making it difficult to categorise them. This is especially the case for Air Berlin, which operates traditional regular services and charter flights, as well as low cost flights. 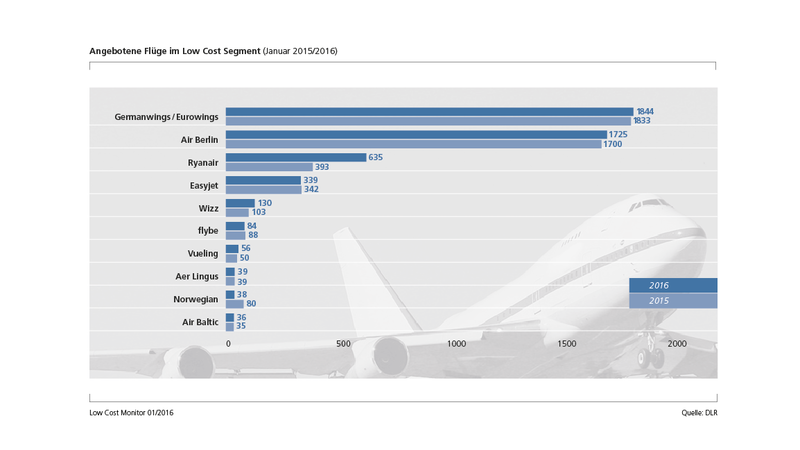 For this reason, the airlines considered by DLR in the Low Cost Monitor are not identified in terms of their business model, but on the basis of the high number of flight offers in the low cost sector compared to the overall market. 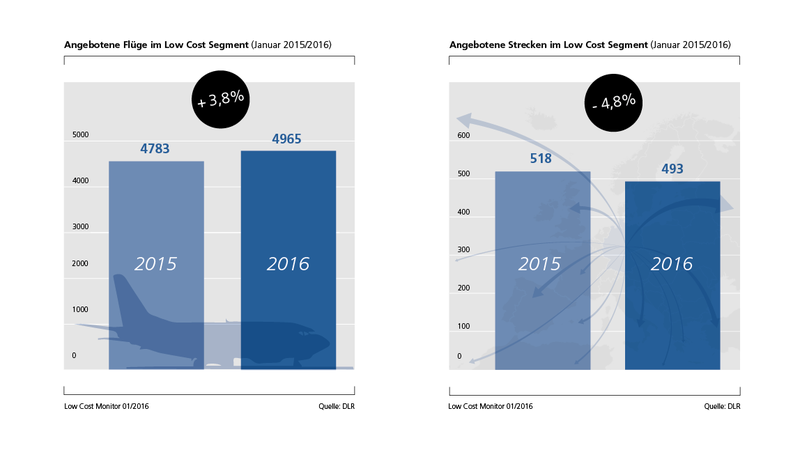 The results outlined can be found in the DLR Low Cost Monitor 1/2016. The report has been published every spring and autumn since 2006 by the DLR Institute of Air Transport and Airport Research.